Day Programs – A Reality! Dedication to the improvement of the overall health of individuals encompassing not only their physical but also their mental and spiritual well being has been the goal of the the Canossian Sisters and the Franciscan Family Apostolate from the start – our way of spreading the love of Jesus. On the last Wednesday of each month, in Veeraghattam, we join with 150 HIV positive patients, including children, for a monthly nutritious program. It is an opportunity for the underprivileged to socialize with us and share their joys and sorrows. We are lucky to have all the Sisters in our community join us to help in this endeavour. The patients are served food cooked by the Sisters along with nutritious packets which cost us Rs.300/- each ($5.00). A small interactive meeting is held to share the grievances and challenges that they face during the month giving us an opportunity to be available to them for any kind of help and inquiry. This service, we feel, is a great privilege God has given us through His instrument, the Franciscan Family Apostolate, to share His mercy and compassion. It has always been a kind of dream we Canossians had to host this kind of a program where the HIV infected people could benefit on a monthly basis. We were fortunate enough to find help from a generous Franciscan Family Apostolate sponsor to hold these monthly meetings and all they entail. This past June, we gathered our children for a day programme. We distributed Horlicks, Amul milk powder and ground nut for all which cost Rs.500 ($8.00) per person. 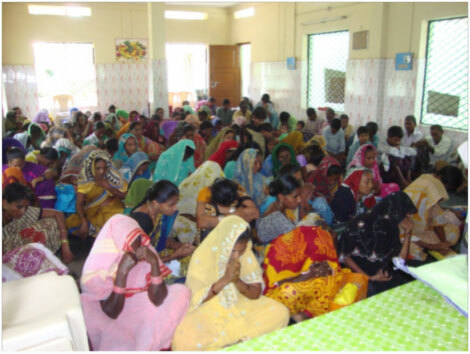 They were extremely happy as we provided not only a prepared meal for them but also new dress materials. The boys were given materials for shirts and pants and the girls for suits. We have been extremely fortunate to receive constant help and support from the Franciscan Family Apostolate when we need it the most – helping us to bring to reality these day programs for HIV patients. It significantly changed the lives of these poor people and we couldn’t be more grateful to those who made it all possible. ← Family of the Month – The Thumalapapalli Family – Sponsored!